I am wondering if Eugene Grew has any old photos of the employees in front of the candy counter from the dates 1971-1972 or 73? My sister and I both worked there during the time Fiddle on the Roof was playing. I would appreciate if anyone has any of these old photos? This was a wonderful and beautiful movie theater and we really enjoyed working there as teenagers. Thank you. I moved there as the GM when AMC acquired it from SDT in 1986. We all went down and then we were delayed until after Memorial Day. I remember we lowered concession prices and a small drink and small popcorn was $1. 98 with the tax. Also a promotion was already set up by SDT so I took over with a promotion already in place with Anthony Perkins there for release of one of the Psycho Movies. Bud Leamon was the SDT manager there and then worked for me until I moved to the Southland Mall 4 in September of the year when AMC bought the MGT chain. Mr. Kirkland: Such a treat finding your posting, especially the glowing accolades about me. You're very kind, but perhaps the years have dimmed the memory. Well, perhaps not! I have some group photos that I can scan should you want to add them to your post. I'm looking at one now, perhaps you have it. A black and white, with you standing top row center, proudly in your uniform replete with cap with me and 25 others. Circa 1966. eegrew@comcast. net Regards, Grew. I was one of the original ushers hired at the theatre. Our grand opening was September 16, 1966. I remember a champagne party taking place prior to the opening. There were local celebs, news media, etc. Torn Curtain was our first cinema. I worked there until 1968, Funny Girl was still playing. Eugene Grouix, sounds like grew. The Solone brothers were the owners of the theatre chain at the time. My starting rate was $1. 15 per hour, usherettes were hired at $1. 05 per hour. Gene (Mr. Grouix) hired handsome ushers and beautiful usherettes, I think eye appeal was paramount, due to Northland being the flagship of the theatre chain. Gene was the best of the best, I've yet to see someone as fast on an adding machine, the paper was a foot long in minutes! Gene was also the best guitarist I've ever seen, and I've seen them all. Genes manual dexterity was almost unbelievable. He played the Grand Ol Opre, Motown, and I don't know how many others. I asked him why he quit playing, he told me he couldn't sing, and that he was tired of doing all the work (Lead guitar) and the singer getting all the girls. I have a lot of fond memories from working at the theatre. Email me if there's anything you'd like to know. By the way, we seated 1474. Is open under new name. I am the Facility Manager at the Millennium Centre, formerly the Northland Theater. We are a performing arts centre with a VARIETY of events taking place from movie premieres, stage plays, concerts, dance competitions, fashion shows, business meetings, etc. We underwent an extensive renovation in 1999 and re-opened our doors in 2000. We welcome All to come visit us and see what we have to offer now. We have a 1028 seats in the auditiorium and a 4000 square foot lobby plus a Class C liquor license. If anyone has any old photos or stories from the old Northland days to pass along please contact me at pnantais@cityofsouthfield. com. Paulette Nantais. 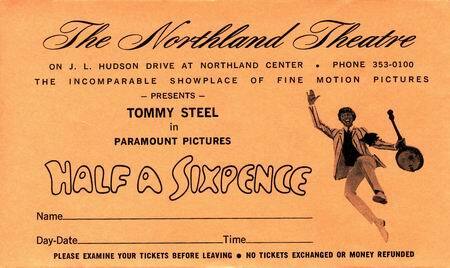 Opened in 1966, the Northland Theater was designed by the firm of Ted Rogvoy, and located at the Northland Mall. This modernistic-style movie house with its unusually-shaped curving and upturned roof could seat nearly 1500. The first movie screened at the Northland was Hitchcock's Torn Curtain. 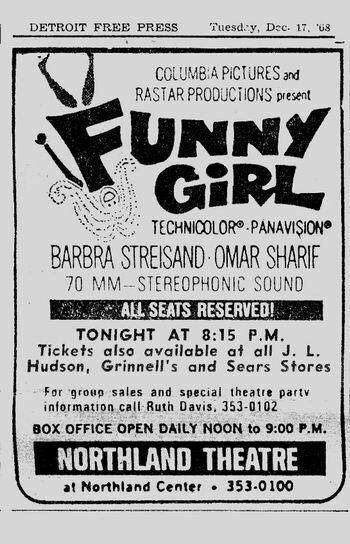 By the late 60s, the theater had become a 70mm roadshow house, including a year-long run of Funny Girl. 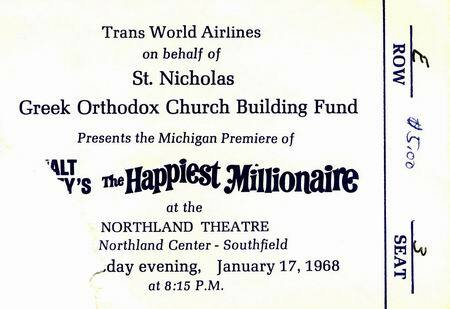 Both the Northland and Americana, also in Southfield, fiercely competed as roadshow houses for many years, and the Northfield would end up usually showing the better films most of the time. The large original auditorium was twinned in 1976. A decade later, AMC Theatres acquired the Northland, but only three years later, it was shuttered, due in large part to declining audiences and growing violence in and around the theater (a problem shared with the Americana as well in the late 80s). Today, after standing vacant for years, the former Northland operates as a mixed use live and movie venue, featuring East Indian entertainment, called the Millenium Theater. Cinema Treasures Link.